For other uses, see O Canada (disambiguation). "O Canada" (French: Ô Canada) is the national anthem of Canada. The song was originally commissioned by Lieutenant Governor of Quebec Théodore Robitaille for the 1880 Saint-Jean-Baptiste Day ceremony; Calixa Lavallée composed the music, after which, words were written by the poet and judge Sir Adolphe-Basile Routhier. The original lyrics were in French; an English translation was published in 1906. Multiple English versions ensued, with Robert Stanley Weir's version in 1908 gaining the most popularity, eventually serving as the basis for the official lyrics enacted by Parliament. Weir's lyrics have been revised three times, most recently when An Act to amend the National Anthem Act (gender) was enacted in 2018. The French lyrics remain unaltered. "O Canada" had served as a de facto national anthem since 1939, officially becoming the country's national anthem in 1980 when Canada's National Anthem Act received royal assent and became effective on July 1 as part of that year's Dominion Day (now known as Canada Day) celebrations. True patriot love in all of us command. Will protect our homes and our rights. It has been noted that the opening theme of "O Canada" bears a strong resemblance to the "March of the Priests" from the opera The Magic Flute, composed in 1791 by Wolfgang Amadeus Mozart. The line "The True North strong and free" is based on the Lord Tennyson's description of Canada as "that true North, whereof we lately heard / A strain to shame us". In the context of Tennyson's poem To the Queen, the word true means "loyal" or "faithful". The lyrics and melody of "O Canada" are both in the public domain, a status unaffected by the trademarking of the phrases "with glowing hearts" and "des plus brillants exploits" for the 2010 Winter Olympics in Vancouver. Two provinces have adopted Latin translations of phrases from the English lyrics as their mottos: Manitoba—Gloriosus et Liber (Glorious and Free)—and Alberta—Fortis et Liber (Strong and Free). Similarly, the Canadian Army's motto is Vigilamus pro te (we stand on guard for thee). The original French lyrics of "O Canada" were written by Sir Adolphe-Basile Routhier, to music composed by Calixa Lavallée, as a French Canadian patriotic song for the Saint-Jean-Baptiste Society and first performed on June 24, 1880, at a Saint-Jean-Baptiste Day banquet in Quebec City. At that time, the "Chant National", also by Routhier, was popular amongst Francophones as an anthem, while "God Save the Queen" and "The Maple Leaf Forever" had, since 1867, been competing as unofficial national anthems in English Canada. "O Canada" joined that fray when a group of school children sang it for the 1901 tour of Canada by the Duke and Duchess of Cornwall (later King George V and Queen Mary). This was the first known performance of the song outside Quebec. Five years later, the Whaley and Royce company in Toronto published the music with the French text and a first translation into English by Thomas Bedford Richardson and, in 1908, Collier's Weekly magazine held a competition to write new English lyrics for "O Canada". The competition was won by Mercy E. Powell McCulloch, but her version never gained wide acceptance. In fact, many made English translations of Routhier's words; however, the most popular version was created in 1908 by Robert Stanley Weir, a lawyer and Recorder of the City of Montreal. Weir's original lyrics from 1908 contained no religious references and used the phrase "thou dost in us command" before they were changed by Weir in 1913 to read "in all thy sons command". In 1926, a fourth verse of a religious nature was added. A slightly modified version was officially published for the Diamond Jubilee of Confederation in 1927, and gradually it became the most widely accepted and performed version of this song. The tune was thought to have become the de facto national anthem after King George VI remained at attention during its playing at the dedication of the National War Memorial in Ottawa, Ontario, on May 21, 1939; though George was actually following a precedent set by his brother, Edward, the previous king of Canada, when he dedicated the Canadian National Vimy Memorial in France in 1936. By-laws and practices governing the use of song during public events in municipalities varied; in Toronto, "God Save the Queen" was employed, while in Montreal it was "O Canada". Prime Minister Lester B. Pearson in 1964 said one song would have to be chosen as the country's national anthem and the government resolved to form a joint committee to review the status of the two musical works. 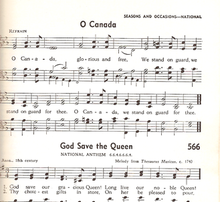 The next year, Pearson put to the House of Commons a motion that "the government be authorized to take such steps as may be necessary to provide that 'O Canada' shall be the National Anthem of Canada while 'God Save the Queen' shall be the Royal Anthem of Canada", of which parliament approved. In 1967, the Prime Minister advised Governor General Georges Vanier to appoint the Special Joint Committee of the Senate and House of Commons on the National and Royal Anthems; the group first met in February and, within two months, on April 12, 1967, presented its conclusion that "O Canada" should be designated as the national anthem and "God Save the Queen" as the royal anthem of Canada, one verse from each, in both official languages, to be adopted by parliament. The group was then charged with establishing official lyrics for each song. For "O Canada", the Robert Stanley Weir version of 1908 was recommended for the English words, with a few minor changes: two of the "stand on guard" phrases were replaced with "from far and wide" and "God keep our land". In 1970 the Queen in Right of Canada purchased the right to the lyrics and music of "O Canada" from Gordon V. Thompson Music for $1. The song finally became the official national anthem in 1980 with the passage of the National Anthem Act. The act replaced two of the repetitions of the phrase "We stand on guard" in the English lyrics, as had been proposed by the Senate Special Joint Committee. This change was controversial with traditionalists and, for several years afterwards, it was not uncommon to hear people still singing the old lyrics at public events. In contrast, the French lyrics are unchanged from the original version. In June 1990, Toronto City Council voted 12 to 7 in favour of recommending to the Canadian government that the phrase "our home and native land" be changed to "our home and cherished land" and that "in all thy sons command" be partly reverted to "in all of us command". Councillor Howard Moscoe said that the words "native land" were not appropriate for the many Canadians who were not native-born and that the word "sons" implied "that women can't feel true patriotism or love for Canada". Senator Vivienne Poy similarly criticized the English lyrics of the anthem as being sexist and she introduced a bill in 2002 proposing to change the phrase "in all thy sons command" to "in all of us command". In the late 2000s, the anthem's religious references (to God in English and to the Christian cross in French) were criticized by secularists. In the speech from the throne delivered by Governor General Michaëlle Jean on March 3, 2010, a plan to have parliament review the "original gender-neutral wording of the national anthem" was announced. However, three-quarters of Canadians polled after the speech objected to the proposal and, two days later, the prime minister's office announced that the Cabinet had decided not to restore the original lyrics. In another attempt to make the anthem gender-neutral, Liberal MP Mauril Bélanger introduced a private member's bill in September 2014. His Bill C-624, An Act to amend the National Anthem Act (gender), was defeated at second reading in April 2015. Following the 2015 federal election, Bélanger reintroduced the bill in the new parliament as Bill C-210 in January 2016. In June 2016, the bill passed its third reading with a vote of 225 to 74 in the House of Commons. The bill passed its third reading in the Senate with a voice vote on January 31, 2018 and received royal assent on February 7, 2018. Below are some slightly different versions of the second and third stanzas and the chorus, plus an additional fourth stanza. These are rarely sung. O Canada! Where pines and maples grow. Great prairies spread and lordly rivers flow. Our own beloved native land! The first verse is the same. The other verses follow. Le Canadien grandit en espérant. Il gardera l'honneur de son drapeau. Il porte au front l'auréole de feu. Sur notre sol asseoir la vérité. Remplis nos cœurs de ton souffle immortel! Sous le joug de la foi. Le cri vainqueur : "Pour le Christ et le roi!" The battle cry: "For Christ and King!" "O Canada" is routinely played before sporting events involving Canadian teams. Singers at such public events often mix the English and French lyrics to represent Canada's linguistic duality. Other linguistic variations have also been performed: During the opening ceremonies of the 1988 Winter Olympics in Calgary, "O Canada" was sung in the southern Tutchone language by Yukon native Daniel Tlen. At a National Hockey League (NHL) game in Calgary, in February 2007, Cree singer Akina Shirt became the first person ever to perform "O Canada" in the Cree language at such an event. Major League Baseball, Major League Soccer, the National Basketball Association, and the NHL all require venues to perform both the Canadian and American national anthems at games that involve teams from both countries (including all-star games), with the away team's anthem being performed first, followed by the host country. The NHL's Buffalo Sabres play both anthems before every home game, regardless of the opponent, in recognition of the team's significant Canadian fanbase. Major League Baseball teams have played the song at games involving the Toronto Blue Jays and the former Montreal Expos, and National Basketball Association teams do so for games involving the Toronto Raptors, and previously, the Vancouver Grizzlies. Major League Soccer has the anthem performed at matches involving Toronto FC, Montreal Impact, and Vancouver Whitecaps FC. The National Anthem Act specifies the lyrics and melody of "O Canada", placing both of them in the public domain, allowing the anthem to be freely reproduced or used as a base for derived works, including musical arrangements. There are no regulations governing the performance of "O Canada", leaving citizens to exercise their best judgment. When it is performed at an event, traditional etiquette is to either start or end the ceremonies with the anthem, including situations when other anthems are played, and for the audience to stand during the performance. Civilian men usually remove their hats, while women and children are not required to do so. Military men and women in uniform traditionally keep their hats on and offer the military salute during the performance of the anthem, with the salute offered in the direction of the Maple Leaf Flag if one is present, and if not present it is offered standing at attention. In the 1950s, "O Canada's" melody was adapted for the school anthem of the Ateneo de Manila University. Titled "A Song for Mary" or simply "The Ateneo de Manila Graduation Hymn", the song's lyrics were written by James B. Reuter SJ, and the tune was adapted by Col. José Campaña. ^ a b c d e f g h i j k Department of Canadian Heritage. "Full history of 'O Canada'". Government of Canada. Retrieved June 2, 2016. ^ Marshall, Alex (February 9, 2018). "The women who fought to make Canada's national anthem gender-neutral". BBC News. Retrieved February 9, 2018. ^ DeRocco, David (2008). From sea to sea to sea : a newcomer's guide to Canada. Full Blast Productions. pp. 121–122. ISBN 978-0-9784738-4-6. ^ Department of Canadian Heritage. "Patrimoine canadien – Hymne national du Canada". Queen's Printer for Canada. Retrieved June 26, 2008. ^ Canada. Parliament, House of Commons. (1964). House of Commons debates, official report. 11. Queen's Printer. p. 11806. ^ a b Colombo, John Robert (February 1995). Colombo's All-Time Great Canadian Quotations. Stoddart. ISBN 0-7737-5639-6. ^ "Olympic mottoes borrow lines from O Canada". Canadian Broadcasting Corporation. September 25, 2008. Retrieved September 25, 2008. ^ Elizabeth II (July 27, 1993). "The Coat of Arms, Emblems and the Manitoba Tartan Amendment Act". Schedule A.1 [subsection 1(3)]. Winnipeg: Queen's Printer for Manitoba. Retrieved July 7, 2010. ^ "Alberta Culture and Community Spirit – Provincial Motto, Colour and Logos". Culture.alberta.ca. June 1, 1968. Retrieved April 15, 2011. ^ a b Bélanger, Claude. "The Quebec History Encyclopedia". In Marianopolis College (ed.). National Anthem of Canada. Montreal: Marianopolis College. Retrieved July 5, 2010. ^ Kuitenbrouwer, Peter (June 27, 2017). "The Strange History of 'O Canada'". The Walrus. Retrieved July 7, 2017. ^ The Common School Book of Vocal Music: A One-Book Course of Song and Study for Use in Schools of Mixed Grades. Toronto: W. J. Gage & Co. 1913. ^ a b c Potvin, Gilles; Kallmann, Helmut. "O Canada". The Canadian Encyclopedia. Toronto: Historica Foundation of Canada. Retrieved November 10, 2015. ^ a b "Bill to Amend—Second Reading—Debate Adjourned". Hansard. Ottawa: Queen's Printer for Canada. 1st Session, 37th Parliament. February 21, 2002. Retrieved October 10, 2014. ^ Bethune, Brian (July 7, 2011). "A gift fit for a king". Maclean's. Toronto: Rogers Communications. ISSN 0024-9262. Retrieved July 9, 2011. ^ a b Galbraith, William (1989). "Fiftieth Anniversary of the 1939 Royal Visit". Canadian Parliamentary Review. Ottawa: Commonwealth Parliamentary Association. 12 (3): 10. Archived from the original on December 5, 2012. Retrieved March 10, 2010. ^ Kallmann, Helmut. "National and Royal Anthems". The Canadian Encyclopedia. Toronto: Historica Foundation of Canada. Retrieved June 25, 2010. ^ Helmut Kallmann, Marlene Wehrle. "Gordon V. Thompson Music". The Canadian Encyclopedia. Retrieved August 2, 2013. ^ "National anthem: O Canada". Canoe. May 26, 2004. Archived from the original on March 11, 2010. Retrieved July 6, 2010. ^ Byers, Jim (June 6, 1990). "'O Canada' offensive, Metro says". Toronto Star. p. A.2. ^ Thomas, Doug (May 17, 2006). "Is Canada a Secular Nation? Part 3: Post-Charter Canada". Institute for Humanist Studies. Archived from the original on June 20, 2010. Retrieved March 27, 2010. ^ "O Canada lyrics to be reviewed". MSN. March 3, 2010. Retrieved July 6, 2010. ^ "English-Speaking Canadians Reject Changing Verse from "O Canada"". Angus Reid Public Opinion. March 5, 2010: 1. ^ "National anthem won't change: PMO". Canadian Broadcasting Corporation. March 5, 2010. Retrieved April 11, 2016. ^ "Private Member's Bill C-624 (41–2)". LEGISinfo. Parliament of Canada. Retrieved March 3, 2018. ^ "Private Member's Bill C-210 (42–1)". LEGISinfo. Parliament of Canada. Retrieved June 6, 2016. ^ "Dying MP's gender-neutral O Canada bill passes final Commons vote". CBC News. The Canadian Press. June 15, 2016. Retrieved June 15, 2016. ^ Tasker, John Paul (January 31, 2018). "'In all of us command': Senate passes bill approving gender neutral anthem wording". CBC News. Retrieved January 31, 2018. ^ Tasker, John Paul (February 7, 2018). "O Canada now officially gender neutral after bill receives royal assent". CBC News. Retrieved February 7, 2018. ^ Office of the Lieutenant Governor of Alberta. "O Canada" (PDF). Queen's Printer for Alberta. Archived from the original (PDF) on April 13, 2008. Retrieved April 17, 2008. ^ "Turin Bids Arrivederci to Winter Olympics". The New York Times. Associated Press. February 26, 2006. Retrieved May 4, 2008. ^ "Daniel Tlen". Yukon First Nations. Retrieved March 31, 2010. ^ "Edmonton girl to sing anthem in NHL first at Saddledome". Canadian Broadcasting Corporation. February 1, 2007. Retrieved April 17, 2008. ^ Allen, Kevin (March 23, 2003). "NHL Seeks to Stop Booing For a Song". USA Today. Retrieved October 29, 2008. ^ Wayne C. Thompson (2012). Canada 2012. Stryker Post. p. 11. ISBN 978-1-61048-884-6. ^ Department of Justice (2011). "National Anthem Act (R.S.C., 1985, c. N-2)". Queen's Printer for Canada. Retrieved April 15, 2011. ^ a b Department of Canadian Heritage. "Anthems of Canada". Government of Canada. Retrieved June 2, 2016. ^ "A Song For Mary". ateneo.edu. Retrieved June 14, 2015. Canadiana — The Bizarre History of "O Canada"